In this chapter, Borgmann is concerned to shore up the validity of the distinction between the substantive, instrumental, and pluralist views of technology. These distinctions carve up the possible theoretical space in a certain way, and Borgmann concedes that any such classification is going to suppress some aspects of reality and highlight others. We therefore need to be mindful of this in selecting a space within which to develop a theory of technology, and it’s open to anyone to ask whether Borgmann’s categorization is the best, or even a good, one. What Borgmann gives us in Chapter 3 is essentially a case study: he examines a different classification of ideas about technology, namely that of Carl Mitcham. In comparing the features of Mitcham’s distinctions and their fruitfulness for providing an appropriate arena for asking and answering questions about technology, Borgmann is trying to convince us that we should stick with his picture. He does this with a measure of humility; he does not critique Mitcham’s classification (in fact much of the chapter praises it) so much as point out where it leaves residual areas of potential confusion. Mitcham makes the same basic distinction Borgmann did, between the narrow sense of technology as engineering science and the broad sense of it in all its interfaces with society. The subsequent challenge Mitcham takes up is to address whether technology may be thought of as an “all-pervasive approach” to human affairs. (In other words, technology is one instance of a more inclusive phenomenon). He rejects this “radical” thesis, deciding that technology is rather “the human making and using of material artifacts in all forms and aspects” (13). (Here Borgmann says as an aside that the above challenge is the basis of his introduction of the distinction between the substantive and instrumental views). 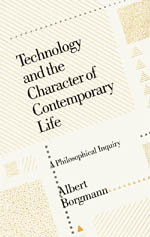 That technology is a “making” implies that it is not a “doing” in the Aristotelian sense (where human “doing” encompasses political, moral, and religious action), though Borgmann questions whether this distinction is even valid in modern society, given that “making” has so eclipsed “doing” in general. For Borgmann, Mitcham’s multi-tiered classification of technology obscures as much as it illuminates, and he thinks the core questions are addressed better by the substantive/instrumental/pluralist distinctions. These distinctions form a set of competing tensions—no one viewpoint can be correct, he says, because modern technology is too complex. Within their defining boundaries, then, what can we discern as the fundamental pattern of technology? That is the task at hand. One major obstacle in pursuing this task is the lack of a “principled understanding of science.” Science and technology are usually thought of in the same vein (or as essentially identical approaches to knowledge and action, respectively), but Borgmann claims this is a fatally misleading assumption, and will spend the next few chapters discussing the relationship between these two concepts. I love this quote as it highlights one of my primary concerns about the academic view of technology — as a straight means-ends sort of thing. If you have a hammer, everything is a nail. Find the problem, solve the problem. What is the problem that open source solves? Even more localized, what is the problem that Linux solves? These don’t even seem to be the right questions. Ultimately we need theory that can test against the dimensions of technology as doing, not technology as solving problems.